The dead remainder of a normal sized star, its former core. This has about the size of the Earth, its mass is below 1.44 solar masses. So it has an enormous average density, a hundered thousand times more than this of a normal star. The star consists for the most part of helium, carbon and similar elements but can't generate the necessary pressure to fusion these. Therefore it slowly cools and gets dimmer. Sometime, after several billion years, it ends as black dwarf. Unless something special happens like a nova. Young white dwarfs are still surrounded by the rest of their former hull, so called planetary nebulae. This name they have got because in small telescopes they look like planets, but have nothing to do with planets. 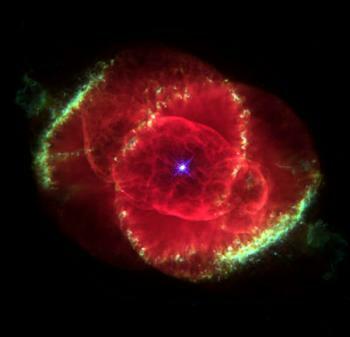 Cat Eye Nebula with a white dwarf.